Will Ferrell reprises his comedic role as Ron Burgundy, the boastful news anchorman, in a robust campaign which debuts from Dodge on Saturday, October 5. The integrated cross-promotion marketing campaign marks the first time a movie studio and brand tie-in has utilized starring talent, in character, to create original long and short form content. The co-branded promotional advertising campaign will span television, print, digital and social media. It debuted across television and online on Saturday, October 5. The new 2014 Dodge Durango arrives in dealerships in North America this month. “Anchorman 2: The Legend Continues” releases nationally in theaters December 20, 2013. The campaign brings together the might of the Detroit automaker, the Hollywood studio and the actor/comedian in a unique collective experience that promises to engage consumers through specifically created content across multiple platforms. 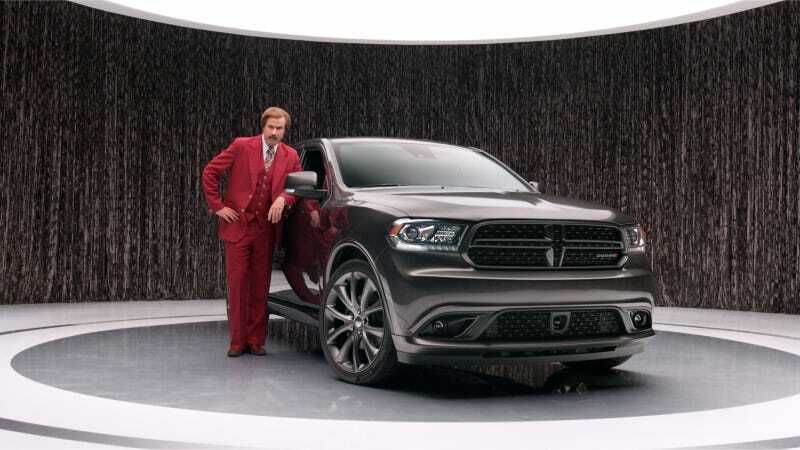 The campaign’s co-branded television commercials and online content, directed by Jake Szymanski, are set in a colorful auto showroom where Ron Burgundy hilariously brings to life what makes Dodge such an entertaining, spirited brand and the Durango a superior SUV. As a leading news anchor and celebrity, pitching for Dodge—or anything else for that matter—is a cinch. He doesn’t need scripts or to study up on auto features. And because he’s Ron Burgundy, interpreting the modern Dodge Durango through his 1970s brain, he’s got a decidedly different take on the cross-over sport utility vehicle. “Ballroom Dancers”: This two-part spot (a .60-second and .30-second spot) will debut on “Dancing with the Stars” on Monday, October 7. In the .60-second spot, Ron walks alongside the vehicle with ballroom music playing in background, noting its “power, precision, elegance, grace in form, truth in function” when a couple dancing glides upon the scene. Ron loses his temper and chases them off, yelling, “Hey, get out of here you dumb dancers! I told them 100 times they can’t dance in here.” He apologizes, asks them to come back, then proceeds to go after them a second time. In the 30-second spot, the couple sneaks onto the quiet floor presuming it’s safe to once again begin to dance. Ron suddenly leaps out from the back seat of the Dodge Durango, in full pursuit of them. Additional spots will roll out in the coming weeks, all of which can be viewed on the uniquely-branded BurgundyDodge.com page, as well as Ferrell and McKay’s comedy website FunnyorDie.com. Television spots will air across broadcast and cable including ESPN, Comedy Central, E! Entertainment Television, FX, Esquire Network, MLB Network, MTV, NBA, NBC Sports, Spike, TBS, TNT, Travel Channel, Discovery Channel, USA Network, Animal Planet, Adult Swim, Food Network, Nick at Nite, Science Channel, Big Ten Network and AMC, among others. In addition to the uniquely-branded BurgundyDodge.com, social media initiatives include ongoing release of video content on the Dodge brand Facebook page, Ron Burgundy Twitter Takeovers, Instagram video clips, a tumblr page featuring animated GIFS and memes, and a dedicated Pinterest board for Ron Burgundy featuring videos and content. “Just as Ron Burgundy is kind of a big deal, the 2014 Dodge Durango also stands out in a crowd with its combination of best-in-class power, towing and fuel economy, in addition to its class exclusive technology,” said Tim Kuniskis, President and CEO, Dodge Brand. "The Dodge brand's partnership with Paramount Pictures and 'Anchorman 2: The Legend Continues’ aligns perfectly with our consumers' sensibilities." The co-branded campaign extends to national print placements with concepts based on the look and feel of Dodge advertisements from the ‘70s, with a Ron Burgundy spin. Print will begin running nationally in November. The new 2014 Dodge Durango takes everything customers love about Durango and adds the latest advancements in technology to enhance its design, capability and functionality. With a new standard eight-speed automatic transmission, improved fuel economy and performance, new LED exterior lighting, two new interior touchscreens, a new programmable instrument cluster, and an available high-definition dual-screen Blu-ray entertainment system, the 2014 Dodge Durango reaches even higher levels of sophistication, building on its proven performance, utility and comfort. The integrated campaign, created in partnership with independent advertising agency Wieden+Kennedy, based out of Portland, Oregon, and Will Ferrell, will continue with additional content and consumer engagement opportunities in the coming months. For nearly 100 years, Dodge has defined passionate and innovative vehicles that stand apart in performance and in style. Building upon its rich heritage of muscle cars, racing technology and ingenious engineering, Dodge offers a full-line of cars, crossovers, minivans and SUVs built for top performance – from power off the line and handling in the corners, to high-quality vehicles that deliver unmatched versatility and excellent fuel efficiency. Only Dodge offers such innovative functionality combined with class-leading performance, exceptional value and distinctive design. With the all-new 2013 Dodge Dart that achieves up to 41 miles per gallon, the all-new Dodge Charger paired with the ZF eight-speed transmission that achieves a class-leading 31 miles per gallon on the highway, the new Durango and the significantly revamped Grand Caravan – inventor of the minivan – Journey, Avenger and iconic Challenger, Dodge now has one of the youngest dealer showrooms in the United States.